I live and teach in China and run China´s largest ESL blog on WeChat, TEFL Lemon! A timeline on two pages about Black history in America. From slavery, the American Civil War, the first black vote, the civil rights movement to the first black President; Barack Obama. 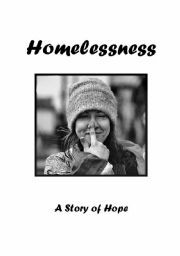 Use this as a discussion starter, writing activity or webquest. Comprehension exercise follows! Divide your students into two groups, one pro-death, the other pro-life. Give each group 20-30 minutes to prepare their arguments using the ideas given. Groups can also think of more. Bring the two groups together and let them debate. Teacher acts as a neutral mediator. Excellent advanced level class. Lots of discussion. A race against time: the countdown to extinction. Lesson plan includes: advanced reading, reading comprehension puzzle, song about extinction with gapfill (key included), an endangered animal adoption activity for your class/school. 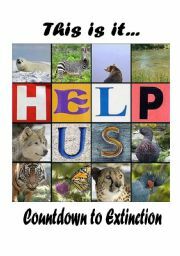 Help Save the Planet! 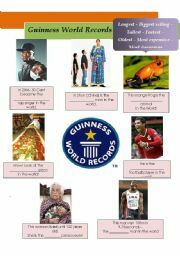 Fun, colourful worksheet about the Guinness World Records using superlatives. Enjoy! 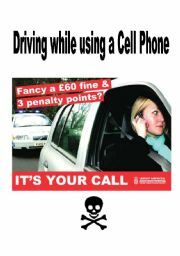 An advanced reading about the dangers of driving while using a cell phone. Comprehension crossword follows with teacher answer key included. A good lead-in to a conversation class. 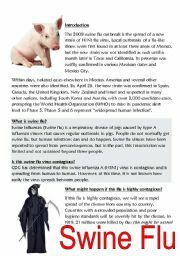 An upper-intermediate+ reading about Pig Flu. The reading includes comprehension questions. 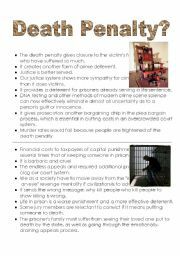 This can be used a pre-discussion activity. 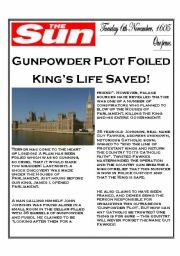 The Gunpowder Plot written in a dirty, tabloid-newspaper style the day after the plot failed! Tricky comprehension wordsearch follows. Good for advanced students. Solid intro into discussion and roleplay. 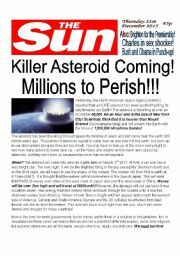 Could branch the topic into tabloid newspaper language. A PowerPoint my student made about interesting things to see in London + reading questions. Good job! This is a fable about a greedy dog. The moral of the story is not to be so greedy. Has comprehension questions after.